“Murder of a Good Man” is the first book in the Piney Woods Mystery series by Teresa Trent and I personally can’t wait for the next one. Trent’s 244 page read is funny, a page turner, and very unpredictable in events that transpire. Nora Alexander travels to Piney Woods, Texas to fulfill her mother’s dying wish to deliver a letter to Adam Brockwell, yet as soon as she gets close to this little hamlet she is run off the road, and when she delivers the letter to the much loved, hero and savior of the town, he is murdered and she is the prime suspect. Nora has no idea who Adam Brockwell is or his relationship to her mother. She has been told by her mother she has no living family and is very secretive about her growing up years. Her father, a police officer, went to work one day and never returned. Homeless, broke and no job prospects, Nora lives in a bed and breakfast with two zany yet compassionate people, Tatty and Ed, till she finds employment in the yet to be revamped Tunie Hotel. Interestingly enough the owner is none other than the police chief’s aunt. The author’s characters are what make this story so interesting in that they are a book on their own. Tuck Watson is a handsome, single man who is determined to make his town safe regardless of their status in town; Adam Brockwell is rich and getting richer by the day, and if you listen to those in town, he saved them all when the oil dried up. Corey, his son, is a spoiled brat with a gambling problem who will stop at nothing to get what is rightfully his. Wiley, a chef who has the ability to make it great if he wasn’t drunk all the time and finally Lucy, a young 20 year-old financial crook who scams Brockwell to get back at him for treating her mother like trash. As I read this fascinating mystery, I could place each of the characters in my small hometown. The plot and the vivid descriptions of the town and characters, give readers a warm, cozy feeling. If you think at any time during the reading that you know “who did it,” you are in for a big surprise. 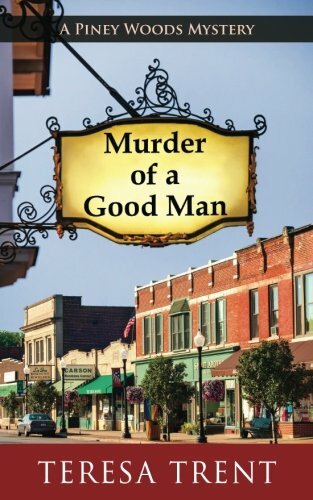 I highly recommend “Murder of a Good Man” by Teresa Trent and can’t wait for the next book to come out.